City of Eau Claire crews dump snow collected off city roads onto property along Galloway Street in Eau Claire on Thursday. View more photos at LeaderTelegramPhotos.com. Every day for the past couple of weeks, between 230 and 300 truckloads of snow have been brought to a dump site off of Galloway Street in Eau Claire. “It depends on the length of the haul, and where it’s coming from,” said Steve Thompson, the city’s street maintenance manager. Thompson estimates the snow pile rests on roughly a 12-acre site. The city has been using just that location for its snow pile for the past year; they no longer use a spot next to First Street. “They are stacking it up higher,” Thompson said. However, the snow pile isn’t anywhere near record-sized, he said. The snow is basically from just the last few weeks, but snow piles in the winter of 2010-11 and 2013-14 were bigger because it was snow from an entire winter. With that said, Thompson said the pile keeps getting bigger by the day. David Walter, Altoona public works director, said one of his tasks this year will be to find a new permanent home for a city snow pile. A new Prevea Health building is being constructed on that property, he explained. 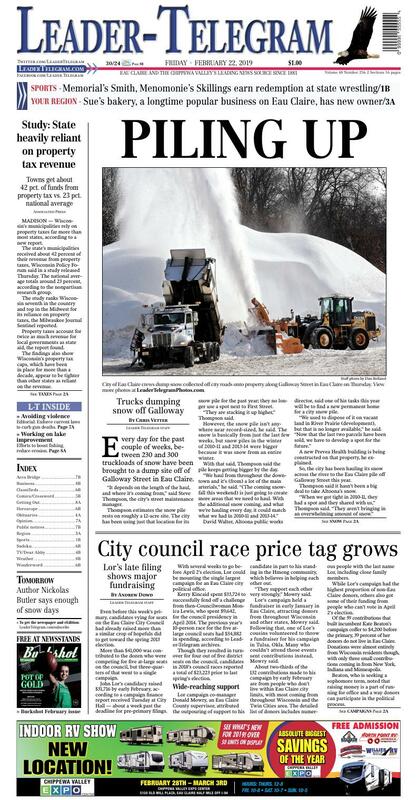 So, the city has been hauling its snow across the river to the Eau Claire pile off Galloway Street this year. Thompson said it hasn’t been a big deal to take Altoona’s snow. Chippewa Falls public works director Rick Rubenzer echoed Thompson’s comments that the snow pile isn’t as big as other years because it is mostly from just the last few weeks, rather than from throughout the entire winter. Rubenzer said the city is in good shape with a full shed of salt, and he anticipates they’ll have enough to get through the winter. However, two of the city’s 14 snow plows are in the shop and won’t be ready for snow removal this weekend, he said. All three directors asked the public for patience. Thompson said there is no end date of when they’ll stop moving snow to the pile, especially with the current forecast of another big snowstorm this weekend. “There will come a time when it will melt faster than we can haul it,” Thompson said. Even before this week’s primary, candidates vying for seats on the Eau Claire City Council had already raised more than a similar crop of hopefuls did to get toward the spring 2013 election. More than $41,000 was contributed to the dozen who were competing for five at-large seats on the council, but three-quarters of that went to a single campaign. John Lor’s candidacy raised $31,716 by early February, according to a campaign finance report received Tuesday at City Hall — about a week past the deadline for pre-primary filings. With several weeks to go before April 2’s election, Lor could be mounting the single largest campaign for an Eau Claire city political office. Kerry Kincaid spent $33,724 to successfully fend off a challenge from then-Councilwoman Monica Lewis, who spent $9,642, for the council presidency in April 2014. The previous year’s 10-person race for the five at-large council seats had $34,882 in spending, according to Leader-Telegram archives. Though they resulted in turnover for four out of five district seats on the council, candidates in 2018’s council races reported a total of $23,223 prior to last spring’s election. Lor campaign co-manager Donald Mowry, an Eau Claire County supervisor, attributed the outpouring of support to his candidate in part to his standing in the Hmong community, which believes in helping each other out. “They support each other very strongly,” Mowry said. Lor’s campaign held a fundraiser in early January in Eau Claire, attracting donors from throughout Wisconsin and other states, Mowry said. Following that, one of Lor’s cousins volunteered to throw a fundraiser for his campaign in Tulsa, Okla. Many who couldn’t attend those events sent contributions instead, Mowry said. About two-thirds of the 132 contributions made to his campaign by early February are from people who don’t live within Eau Claire city limits, with most coming from throughout Wisconsin and the Twin Cities area. The detailed list of donors includes numerous people with the last name Lor, including close family members. While Lor’s campaign had the highest proportion of non-Eau Claire donors, others also got some of their funding from people who can’t vote in April 2’s election. Of the 59 contributions that built incumbent Kate Beaton’s campaign coffer to $4,200 before the primary, 39 percent of her donors do not live in Eau Claire. Donations were almost entirely from Wisconsin residents though, with only three small contributions coming in from New York, Indiana and Minneapolis. Beaton, who is seeking a sophomore term, noted that raising money is a part of running for office and a way donors can participate in the political process. Making a financial contribution can be a substitute for people who don’t have the time or ability to volunteer for campaigns, she added. She also said that running in a large field is different than her first election where six people were running for five seats. “This race is much more competitive than my first one was in 2016,” Beaton said. Other candidates running for council seats had smaller campaign coffers by early February. Former councilman David Klinkhammer’s $1,175 pre-primary war chest came from just eight contributions — including one from himself — and two from outside Eau Claire. Those donations were from Chippewa Falls and Altoona residents. Newcomer Laura Benjamin had four financial supporters from outside of Eau Claire out of the 34 contributions to her campaign that grew to $1,853 by early February. Echo Reardon provided the lone reported contribution — $300 — to her own campaign. Chandler Lorentz was the only other campaign to file a finance report and his had $764 in spending, but no contributions. Reardon and Lorentz got the lowest votes in Tuesday’s primary, which eliminated them from appearing on April 2 ballots. Five campaigns — incumbent Catherine Emmanuelle, newcomers Kate Martin, Kirk Ausman, Dale Poynter and Kyle Woodman — did not file campaign finance reports as they do not intend to raise or spend more than $2,000 in a calendar year. While no more large fundraisers are planned, Mowry said the campaign is going to do a few more smaller “meet-and-greets” with smaller groups and still welcomes contributions. “We’re pretty set in terms in funding we need to run the campaign,” he said. Evidenced by Lor yard signs, advertising and door hangers seen around the city prior to the primary, the campaign already has begun spending. Lor also far outspent his competitors prior to the primary with $17,177 in expenses from January to Feb. 1 shown in his campaign finance filing. Other hopefuls that filed reports showed less than $1,000 in spending. In addition to money, Lor also has been spending time on the campaign trail himself and with volunteers who have been knocking on doors to explain his platform to voters, Mowry said. “We were very happy with the result of the primary, but we’re not going to rest on that success,” Mowry said. Lor came in first with 2,158 votes in Tuesday’s primary, which trimmed the field of council hopefuls from 12 candidates to 10. Beaton’s 1,636 votes put her in second place in Tuesday’s primary. She’s spent money so far on sending out fliers and printing out yard signs, but said that meeting constituents is her focus. While she has one of the larger campaign coffers in the race, Beaton said she intends to center her campaign efforts on meeting people face-to-face. “That’s what I’ve been focusing on and intend to focus on,” she said.